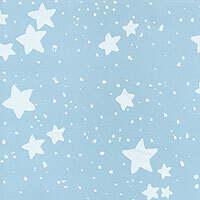 White Chunky Stars Cellophane Roll 24 inches wide x 50 ft long. This is a cute pattern of white stars and dots with a child-like charm and feel to them. The white dots could represent snow or a night sky. Very cute and whimsical type of cello design for your gift baskets or gift bag "tissue". Background is clear cello but shown here as blue so you can see the white areas of the design online.